Did you just purchase an amount of data from an Etisalat data re-seller and wondering how you could check data balance to keep track of consumption? 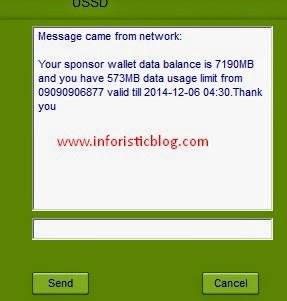 Well, here's how you can check the remaining MB/Data of your shared data on Etisalat NG. To check your remaining MB, simply dial *229*9# from your Etisalat line and you will get a reply containing the remaining MB or data you have left on your allocated data. I hope this was helpful, in my next post i will be sharing with you, a site where you can get 1GB etisalat data for 1,350 Naira with 30 days validity and so many other exciting infos, you won't miss out any of these if you Connect with Inforisticblog on Facebook | Twitter | Google + | Email. Remember to share this post. but the 1,000 for 1gb is not working for all device i.e. all phone. what can I do to work on my etisat because am on easy click?